It's hard to explain the feeling when you first see the Grand Canyon. It's so vast and magnificent it overwhelms the senses. A photo does not justify it's impact, it's like a mountain in reverse. You are at the top of this huge flat plateau and suddenly there it is WOW! With elevations between 5000-7000ft. the weather conditions can be extreme. It was cold at the top 37F or 2.8C and very windy, (more on the wind with a later photo). We were here to hike and it's a LONG way down about 9 miles, and scary in places. You can go all the way down to the Colorado River but not down and up in one day, unless you want to die. 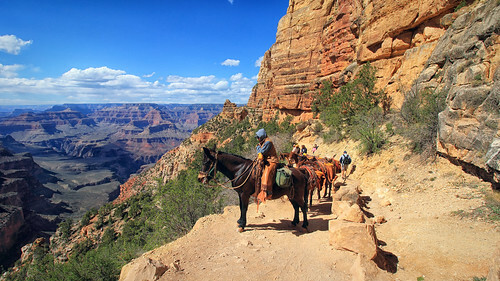 Hiking down with camping gear is very tough, but there are trails suitable for most including the rim trail which is suitable for bike and wheelchairs. We hiked the rim trail and it offers spectacular views from the top. The bus system in the Park is superb they come every ten minutes you hop on an off at various viewing points. 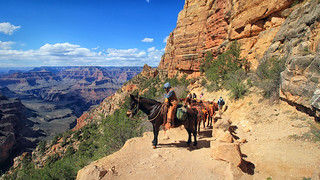 A brilliant way to visit the Grand Canyon if you can't hike down. You can travel down on a mule like the ones here they have a guide and the mules are perfect animals for this terrain. (not for a novice rider). On our first hike we tackled The South Kaibab Trail. This shot of the mules was near the top. Our journey had begun.